Thomas Torak’s The Artist is on view at the Masur Museum as part of En Plein Air: The Artist and the Natural World. Thomas Torak's Self Portrait in Red has received the DiSilvio Family Award at the Hudson Valley Art Association 85th Annual Exhibition. Thomas Torak received the Special Award of Continuing Excellence in Honor of Frank Mason for his painting Golden Delicious at the Salmagundi Club's Summer Members Exhibition. Thomas Torak’s Bread and Wine received the Salmagundi Club Award at the American Artists Professional League 88th Grand National Exhibition. 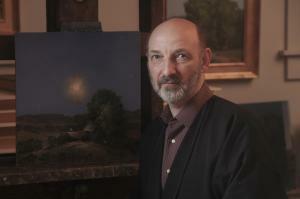 Thomas Torak received the Georgie Read Barton Memorial Award for his painting Bread and Eggs. Thomas Torak’s A Morning Walk won the Allied Artists of America Award at the American Artists Professional League 87th Grand National Exhibition. Thomas Torak is exhibiting three paintings in the Collectors' Reserve: American Art Exhibition and Sale, 2015. Thomas Torak and Joseph Peller are helping celebrate Allied Artists of America's one-hundreth anniversary. Thomas Torak is now represented by Helmholz Fine Art in Manchester Center, VT.
American Artists Professional League Awards Thomas Torak "Best in Show"
Thomas Torak's Autumn Poem was awarded the Newington Award – Best in Show at the American Artists Professional League's 86th Grand National Exhibition. Thomas Torak will be exhibiting in American Masters 2014, the sixth annual art exhibition and sale to benefit the Salmagundi Club. The show, opening October 14, features 135 works of art by 40 representational artists in the club's newly-renovated upper gallery. Virtually every artist, from the time of cave painting to the dawn of non-objective art, will tell you they paint what they see. Painting what you see seems like the most obvious and simplest thing in the world…until you try to do it. As I thought about which books are most important to me and my development as an artist, it gradually dawned on me that it would not be a reading list. Thomas Torak's Painting the Feast received the Marquis Who's Who in American Art References Award at Audubon Artists' 71st Annual Exhibition, which you can see on their site, through December 31. Alive with Paint is a solo show of Thomas Torak’s paintings at Sloane Merrill Gallery (Boston, MA) that runs from October 18 through November 6, 2013. The opening reception is on Friday, October 18. Thomas Torak Is "Alive with Paint"
"Alive with Paint" in the October 2013 issue of The Artist's Magazine describes painter Thomas Torak's philosophy and techniques and includes a demonstration of his above self-portrait, In the Studio. When Elizabeth and I moved to Vermont nearly twenty years ago, the first thing we did was create a space to paint. Behind the attached garage there was a 16 x 24 ft. workroom the builder had used as his carpentry shop, which we thought would make a good temporary studio while we settled in. There are some paintings I have thought about a lot and with which I have long relationships. The recently rediscovered Velázquez Portrait of a Man at the Metropolitan Museum of Art is one of them.